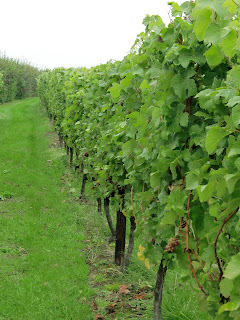 We spent the last weekend of September in Kent, sampling some fantastic English wines. On our last morning we took a drive over to Hush Heath Estate where we met Victoria Ash (Winemaker) and Rupert Taylor (Sales Executive) who despite the rain took us on a brief tour of the estate and winery. Vicky has an impressive CV, having worked extensively in New Zealand (including a stint at Lindauer), and then moving back to the UK to work at Ridgeview Estate and now Hush Heath. Rupert too has an interesting background, initially as a Sommelier at top London restaurants including Locanda Locatelli and our new favourite Trinity. Hush Heath Estate has 450 acres of land. As well as grapes for their wine they are growing apples, although this years crop was bad due to the weather. 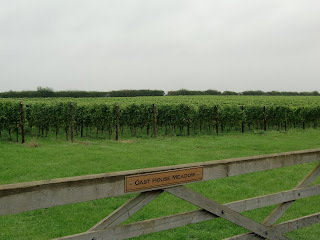 In 2002 they opened the Oast House Meadow vineyard, from which they produced the first three vintages of Balfour Brut Rosé (2004, 2005 and 2006). Balfour Rosé is typically 50% Pinot Noir, 10% Pinot Meunier and 40% Chardonnay. We asked them about how the poor weather this summer is likely to affect this year's vintage. 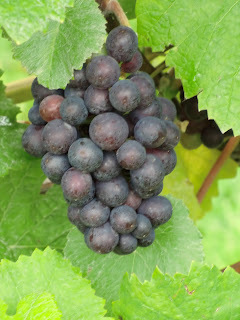 In 2011 the grapes were harvested in September, but this year they had decided to delay the harvest until mid October, in order to give the grapes more time ripening on the vine - this carries an additional risk that if the temperature drops too low, the grapes will all drop and be ruined. 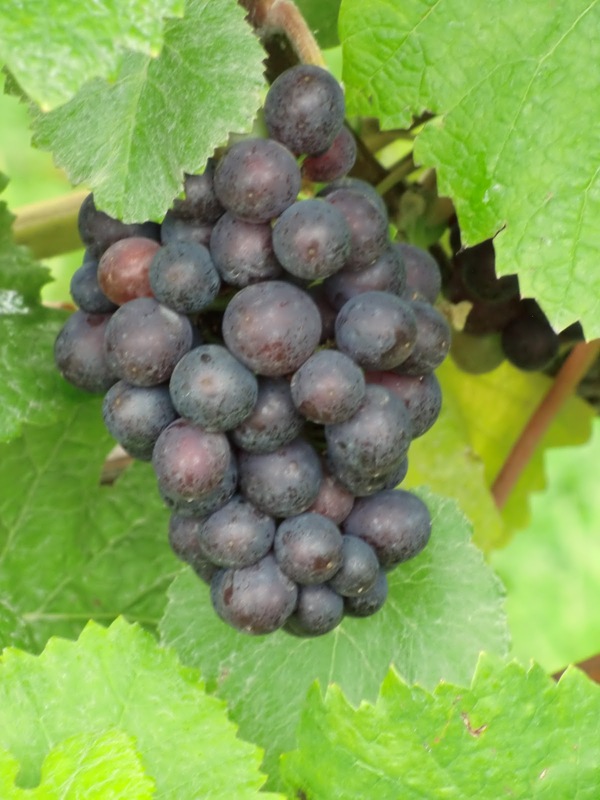 They are hopeful of having enough grapes for a decent vintage this year and they aim for a better quality of fruit rather than preferred timing for the start of the wine making process. The UK's challenging climate makes for a better sparkling wine. 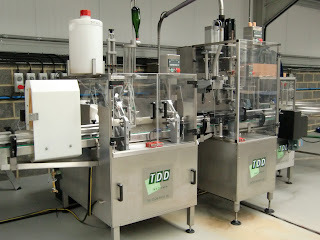 Until now the wines have been made at nearby Chapel Down winery. 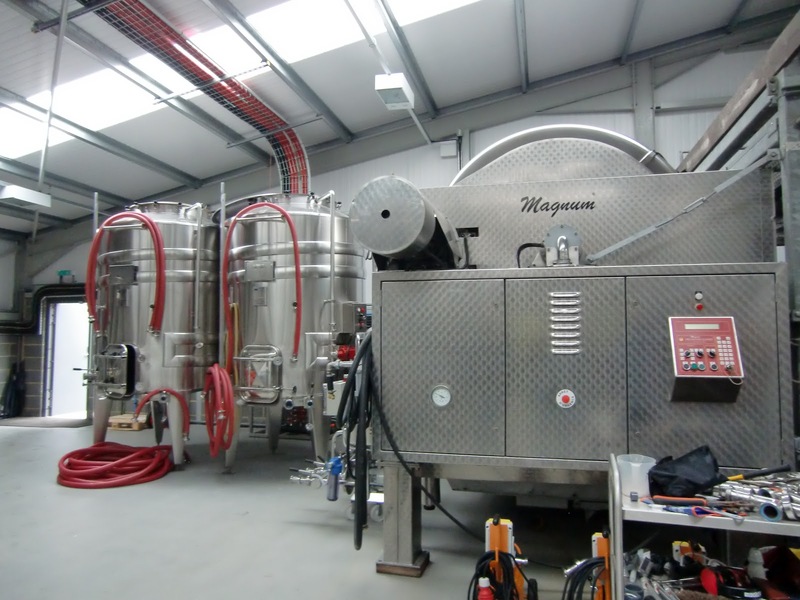 The latest wines are being made in the brand new winery on the Estate which can make up to 100,000 bottles (in 2009 they produced 14,000). For their sparkling wine they do not use oak or malolactic fermentation in order to retain the purity of fruit. The rosé sparkling is made with a separate ferment of the red. 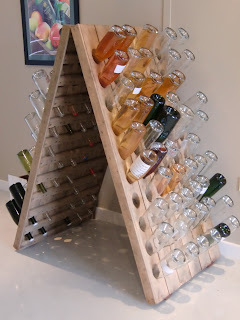 They have thought about doing some still wines but all the harvest has to go into the sparkling this year. In 2010 they made 6000 bottles of a still chardonnay but it commands a premium price due to the difficulty in making/growing, and can be difficult to sell at £20 a bottle. Rectified grape must is used for the dosage. The 2008 vintage was on the lies for 3 years but they disgorge according to demand. A long discussion is always had regarding the correct dosage levels for the Balfour. We tasted the 2008 and 2009 vintages of the Balfour Brut Rosé. The 2008 has a high acidity, and a lovely finish with the flavours of peaches and strawberries. The acidity has changed and reduced over time. The 2009 vintage was just about to be released but it was used for hospitality at the London 2012 Olympics. It was a much riper vintage so has more fruit character and a rounder finish with a darker colour. It was a more immediate, intense and amazing flavour. The 2009 was our preferred choice, although Rupert and Vicky both favour the 2008 vintage - which just shows how much is down to personal preference. 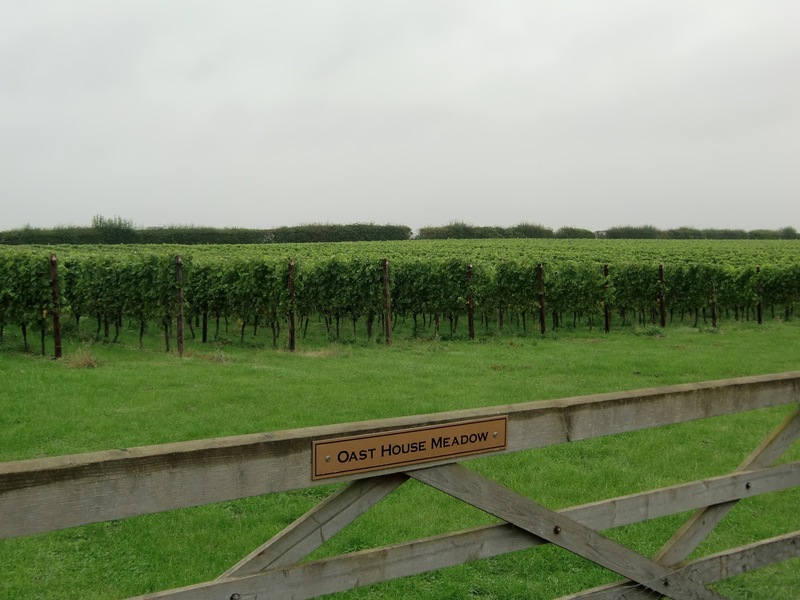 It is testament to the high quality of English wines that they are now able to stand up in competition against Champagne producers. Hush Heath are regularly winning awards with the Balfour Brut Rosé, even from their first year as the 2004 vintage won gold at the 2008 International Wine Challenge. The 2005 vintage won gold at the 2009 Decanter World Wine Awards, and more recently their 2008 vintage won gold in the 2012 Decanter World Wine Awards (the 2009 vintage won silver). 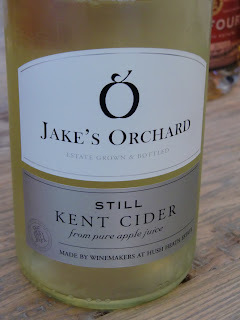 We also got the opportunity to sample a new product they've been making - a range of still ciders. Jake's Orchard still cider has a refined fresh apple flavour, like a high quality juice. You barely notice the alcohol in the taste, and it's incredibly refreshing. It also comes in 3 flavoured varieties; elderflower, nettle and strawberry & blackcurrant. The packaging is very stylish, and it feels like a high end product, specifically designed to be paired with food. We took a sample of each of these away with us, which will be reviewed in a cider and food matching post coming soon. Much like the Power Rangers, when a group of brewers get together with a mission in mind, what they produce can be greater than the sum of their parts. We have recently come across some great examples of inter-brewery collaboration that highlight this. The first of these was the annual Kent Green Hop Beer Fortnight which took place back in September to celebrate the Kent hop harvest. More than twenty Kent breweries brewed special beers from fresh green hops, picked only hours before. These beers were then available for two weeks in pubs all over Kent. We popped along to the launch at the Canterbury food and drink festival - the only place where all the beers were available at once. This is where I felt the joy in this collaboration. 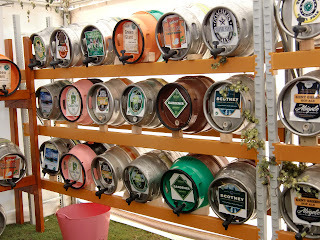 With all the casks up against the back of the tent and the brewers who crafted them dishing them out to thirsty punters. The different breweries obviously relished the challenge of brewing with the green hops. 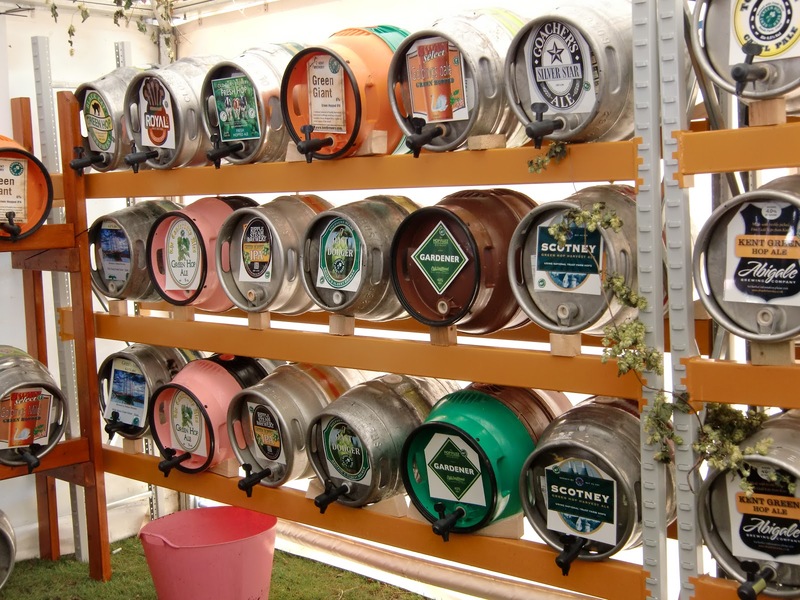 There were a wide range of beer styles on offer - from saison to cask lager - and each showed off the fresh and fragrant character of the green hops. The key here was that all these breweries were working together for the common goal and it was so successful that it looked like the beer wouldn't last the whole two weeks in the pub. Look out for bottled examples of these beers which may still be available. The second look at collaboration is in a very different form. London Brick is a Red Rye Ale that has been brewed by The Kernel, Redemption, Zerodegrees, Dark Star, Phil Lowry, Brodies and probably a few more. Some of these breweries are part of the London Brewers' Alliance which was set up to celebrate and promote the resurgence in London brewing. London Brick : Appropriately named! The beer itself is a stunner. It grabs your attention with it's bright red muddy colour, it's intriguing to say the least. But it's the aroma of sweet tangerines and tropical fruits from the Simcoe that invites you to drink. This is the closest to a tropical island that you will get to in London. The heavy use of rye in the malt bill give a nicely sweet and full body which means this is a full, satisfying drink rather than a refreshing drier hop bomb style. The last collaboration is one we came across in our last visit to Brussels. Horal's Mega Blend is an Oude Gueuze created by Horal, the High Council for Artisinal Lambic Beers and organisers of the annual Tour De Gueuze. Gueuze is created by blending spontaneously fermented lambic beer of different ages. In this case Horal have blended together lambics from eight breweries. Somehow what comes out is a well structured gueuze that gives you everything you could want in the way of citrus sourness and a heady funk. It is a refreshing and engaging beer but perhaps needs a year longer in the bottle. It would be impossible to pick out characters from all the breweries but this delicious beer is a symbol of the continuing resurgence of this traditional style of beer. The brewery names on this label are enough to make a lambic lover weep with joy. These collaborations are about more than the beer itself. They are important missions to celebrate and promote brewing innovations and traditions. The Kent Green Hop Fortnight promotes the use of our excellent native hops. The London Brewers Alliance celebrates the phenomenal quality of breweries in the captial. Horal's Mega Blend helps to keep alive this most important of traditional beer styles. The Kent Green Hop Beers are no longer available but look out for them next year. London Brick and Horal's Mega Blend are available from www.beermerchants.com. This was by far our stand out beer from the Belgian Beer Weekend in Brussels so we brought a bottle back with us. The people from Bavik were at pains to explain that this beer is not a lambic. There are some lambic-like characters to Petrus Aged Pale, it is wood aged and has a powerful sourness. It is more controlled than most lambics and is a very balanced beer. It's a wood-soaked aged sour with delicious sherry, cherry and grape flavours. The age on the beer gives it unique yeast characters and the oak rounds this all off into a real treat. If you like Belgian lambics you will really love this very special beer. Available at www.beermerchants.com and most decent online beer shops for less than £3, it's an absolute bargain. On a recent work trip to Brighton, Claire popped into one of our favourite beer shops, the inaccurately named Trafalgar Wines, and bought me amongst others a bottle of Thornbridge Chiron. 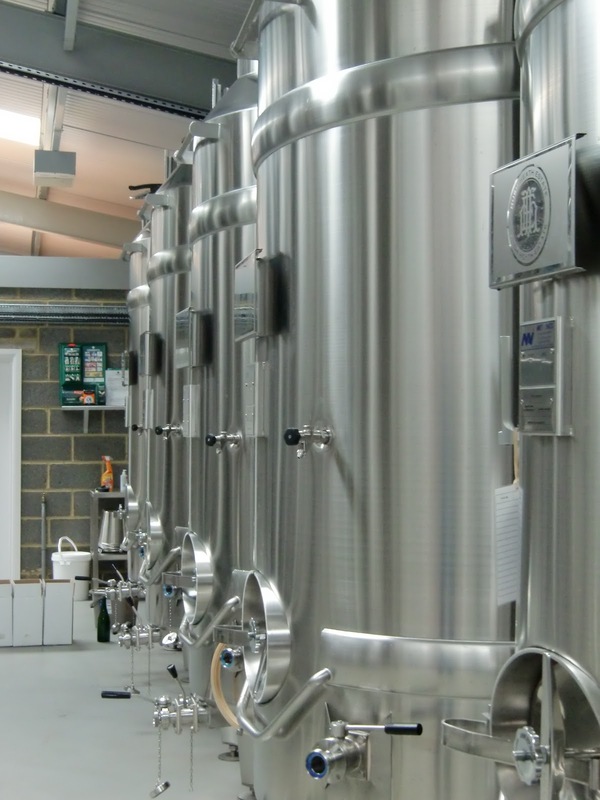 The brewery have been making consistently good beers since 2005 and are admired for their innovation and quality. Their flagship IPA, Jaipur, is a powerful expression of the style but at 5.9% doesn't meet the requirements of a session beer! Chiron is a billed as an American Pale Ale and in many ways lives up to the title. The crisp American hops provide plenty of fruity tangerine and lemon but it still has a British quality of satisfying warmth from a pillow of sweet maltiness. This is a beer you can drink when its bigger brother, Jaipur, would be too strong. Refreshing, satisfying, another excellent beer in the Thornbridge family.